Light, medium, slightly brownish color with bright autumn red reflects. The nose is delicate and aromatic without being too intense yet distinguished aromas of earth, dirt, ripe dark fruit mingled with notes of cigar, tobacco leaf, licorice and some cedar wood and leather caress the nostrils at first sniff. The palate is lighter than I expected for a Pomerol in that particular vintage, yet it is bright, racy, very well balanced and rather feminine. It showed a bit of age already, nothing much but noticeable to the amateurs. Although pretty good too, the texture and structure was also a bit thin. It may come from the age of the wine but it may also be due to how the wine was kept. However, it was very good and very expressive but a bit light. This bottle could have been kept for another 5-8 years, but not more than that. I should taste another bottle to realize if it was the case for that particular bottle or if it is a general pattern for this wine in this particular vintage. 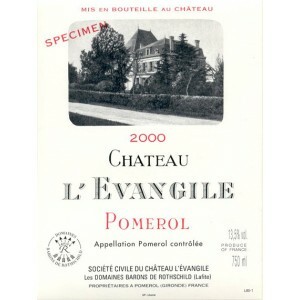 FYI: L'Evangile remains one of my favorite Pomerol which always excel by its consistency and elegance vintage after vintage, but I think that my favorite will always be Vieux Chateau Certan, which has never disappointed me in the last 15 years. I can hear you saying what about Le Pin and Petrus? Well, I opened, tasted and poured countless amount of these 2 stellar wines in various vintages over the last 20 years, they are very good that is true, yet in bad vintage they were not great but still commanded incredibly high prices (like most top tear Bordeaux right and left) and I think that they are a bit overrated in my opinion. During a few "En Primeur" tastings, I had the chance to taste Le Pin at the barrel, in the semi-underground basement of that ugly and indistinct mid-80s squarish concrete house in the middle of the vines flanked with one Pine tree up front (hence the name ... that is right, you can have a old shack lost in the vines or a vulgar garage and still call yourself a Château in Bordeaux). The wine was great for sure, it was a good vintage too, but except due to the price of the land and the international recognition thanks to Robert Parker Jr. and the extremely low availability (only 25 barrels produced max in that basement, which represent about 7,500 bottles from a 2 hectares vineyard), I think that Vieux Chateau Certan, also managed by one of the Thienpont family, is a better value for money, which has nothing to envy Le Pin (or Petrus for that matter) in terms of complexity, length and richness. But I will describe VCC in another post.